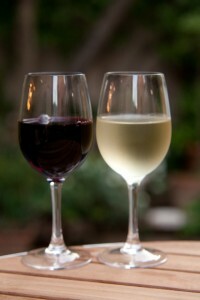 The average red wine is bitter, astringent, and sour. The taste of meat is composed of umami and saltiness. Meat also tastes a little bit sweet. Let’s compare red wine and meat. The bitterness and sourness of red wine is the same strength as the saltiness and umami of meat! The contrast results in a delicious taste. How about red wine and fish? Fish has saltiness and umami too, but in less amounts than in meat. This means the aftertaste of red wine will overwhelm the taste of fish, which leads to an unbalanced flavor. So red wine goes better with meat than fish. How about white wine? White wine is sour and bitter, but not as much as red wine. Meat tastes too strong to go with white wine. However, white wine goes well with fish, because white wine’s sourness and bitterness works nicely with the saltiness and umami of fish. T hat’s why red wine tastes better with meat, and white wine tastes better with fish. I wasn’t sure what you wanted to say in these two cases: So, it feels better contrast between red wine and meat! This entry was posted in Article on 19/08/2014 by Dr. Umami.